For my Scottish readers (and Robert Burns fans) – enjoy your Burns Supper. Burns Night, effectively a second national day, is celebrated on 25 January with Burns suppers around the world, and is still more widely observed than the official national day, St. Andrew's Day. The first Burns supper in The Mother Club in Greenock was held on what they thought was his birthday on 29 January 1802, but in 1803 they discovered from the Ayr parish records that the correct date was 25 January 1759. The format of Burns suppers has not changed since. The basic format starts with a general welcome and announcements, followed with the Selkirk Grace. After the grace, comes the piping and cutting of the haggis, where Burns' famous Address To a Haggis is read and the haggis is cut open. The event usually allows for people to start eating just after the haggis is presented. 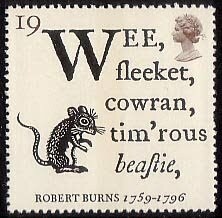 This is when the reading called the "immortal memory", an overview of Burns' life and work, is given; the event usually concludes with the singing of Auld Lang Syne. and blindly enter into another totally different one when you are born. You will repeat this remarkable process again when you die! In the last and final act of separation from the only world that you have ever known, a cord is cut and the life support system that has sustained you since your beginning completely shuts down. Incredibly, an entirely new life support system takes over and you find a way to breathe by catching a new breath. All of this should be familiar territory to you but it's no wonder that you can't remember dieing. Your mind lost consciousness in order to survive the trauma, just like it does during a bad accident. Your throat was sliced, when the surgeon cut the umbilical cord that had sustained you, since your conception. Birth actually seems like death to the one who is about to be born because in childbearing; there are many that do not survive. For them, birth is death. Your Bellybutton is living proof that you had to survive death in order to get here... and there you were thinking, that your Bellybutton was nothing more than a dust collector. MOTHER NATURE GAVE YOU A BELLY BUTTON ON YOUR BIRTHDAY. A Bellybutton is an odd gift indeed but it was given to you, on your very first birthday, so that you would never forget just how remarkable you are. You have already survived death once and you even have the scar to prove it! Your Bellybutton is a symbol of "your past life" and the mark of an extraordinary survivor. Coincidentally, the word "GRAVE" means; to mark, or engrave. Gravestones are "Marking Stones". Bellybuttons and Gravestones are marks that are left behind after a passing. As strange as it may seem, human bodies are transportation devices. You came out of your mother's body when you were born, and you will come out of your own body when you die. A human body brought you into this world and a human body will release you from it. Dying and being born are the very same thing but it's the outcome of the act that determines how we choose to use the words. Human beings are truly remarkable and that is why, we use two words instead of only one, to describe ourselves as a species. We use the term "Human Being" to describe ourselves because there are two separate parts to our nature. The "Human" part of your nature is your Visible Outer Person (VOP). The "Being" part of your nature is your Invisible Inner Person (IIP)... or otherwise known as, your inner person(ality). Your Outer Person(OP) is made of physical matter but your Inner Personality (IP) is not. A doctor cannot find your personality with a scalpel or a microscope and that's too bad... because your personality was essentially created from two other personalities (mother/father), therefore you were born with a "split personality". Your purpose in life is to develop the split-minded personality that you were born with into a "single-minded one, before you die.. Your personality is growing inside of you just like a baby in a womb. It's developing and changing during every minute of every day. In fact, you are not the same person today that you were yesterday, or for that matter... ten minutes ago. Personality growth ends when death begins. Death separates the non-physical part of your nature from the physical part. If your personality is strong enough to survive death... then once again, you will be born into another new life. Where else would newborns for the next life come from? You faced death once before and found out that there was life beyond the womb and, if your personality is strong enough, when you die... YOU WILL ALSO FIND OUT; THAT THERE IS LIFE BEYOND THE TOMB.